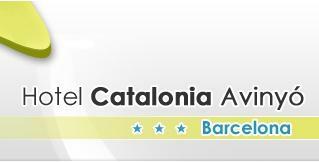 The Hotel Catalonia Avinyó is located a few meters from Plaza Sant Jaume, in the heart of Barcelona's famous Gothic Quarter, very near the Born. Its privileged location puts you within walking distance of the most charismatic parts of the city. The hotel is surrounded by the most charming parts of the city, near the modern and bohemian El Born neighbourhood, where you can enjoy a lively atmosphere, the best tapas and the most exclusive boutiques in a picturesque medieval setting. It is also well served by public transport, both bus (nearest stop is 80 meters on La Rambla, where lines 14, 59 and 91 stop) and the metro (the nearest stations, at 80 meters, are "Liceu ", line 3, and" Jaume I ", line 4). The airport is 15 km away.